Dassault Aviation has announced the sale of a Falcon 5X ultra-wide body twin jet to Wallan Aviation, the prominent Middle East general aviation company. The 5,200 nm 5X will be delivered in 2018 and Wallan Aviation will operate the aircraft for the company’s own use with the option to charter. The agreement was signed at the Middle East Business Aviation (MEBA) show 2014, hosted at Dubai World Central. According to Wallan Aviation, Falcons – including the new Falcon 5X and 8X – are well-suited to the needs of the region, offering long range, spacious and comfortable cabins with low cabin pressure, and large luggage storage capacity. Wallan Aviation have already experienced and operated a Falcon 900EX EASy and a Falcon 900LX. The Middle East region accounts for 20% of worldwide sales for the Falcon 5X, which was introduced in 2013. With a range of 5,200 nm, it can fly passengers nonstop from Dubai to Cape Town or from Riyadh to Tokyo. The 5X is on track for a first flight in the second quarter of 2015 and is expected to begin entering Middle Eastinventories in the second half of 2017. Wallan Aviation has been operating in the Middle East for more than 20 years and has also expanded to other services in the aviation field, including charter, jet maintenance and a flight academy to train the next generation of pilots. The company employs more than 800 staff, with a team of 35 dedicated specifically to aviation. Falcon jet sales in the Middle East are supported by a solid after market presence. Dassault Aviation operates an Authorized Service Center, a spares distribution center and a regional sales office in Dubai, UAE, along with an Authorized Service Center and technical office in Jeddah, Saudi Arabia. Dassault Aviation is a leading aerospace company with a presence in over 80 countries across five continents. It produces the Rafale fighter jet as well as the complete line of Falcons. The company employs a workforce of over 11,000 and has assembly and production plants in both France and the United States and service facilities around the globe. Since the rollout of the first Falcon 20 in 1963, over 2,250 Falcon jets have been delivered. 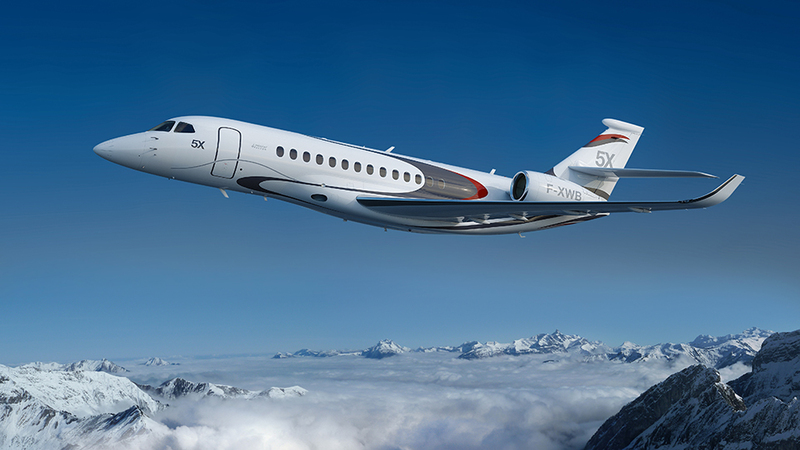 Dassault offers a range of six business jets from the twin-engine 3,350 nm large-cabin Falcon 2000S to its new flagship, the tri-engine 6,450 nm ultra-long-range Falcon 8X. Dassault Falcon Jet Corp. is a wholly owned U.S. subsidiary of Dassault Aviation, France. Dassault Falcon Jet markets and supports the Falcon family of business jets throughout North America, South America and the Pacific Rim countries of Asia, including the People’s Republic of China.